After just two days of play it’s obvious that despite the doubters this is a next gen platform that will be a serious competitor to Sony. In some ways the hardware is really just an enabler for the great services that Microsoft have added to the Xbox platform but it’s where I’m going to start my ramblings. The console itself is big. The design certainly helps to hide the size and standing the console up masks it slightly more than when it’s on it’s side. The console is also heavy which you notice as soon as you lift the box. 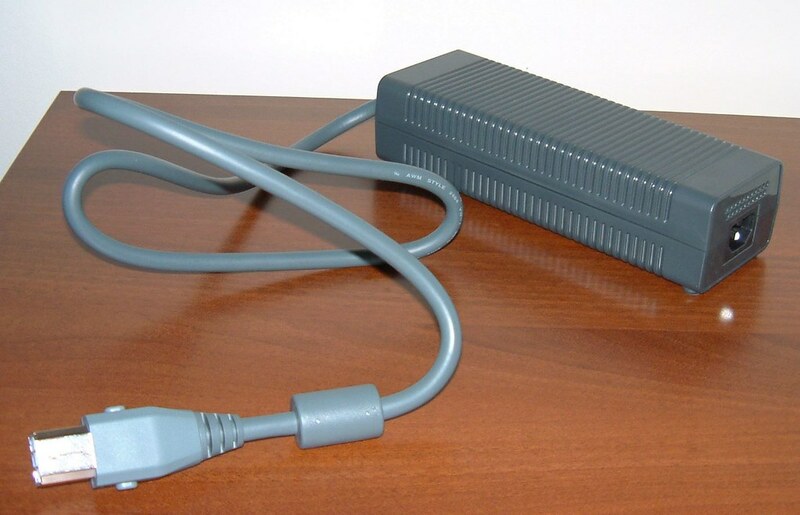 The biggest shock despite the press coverage is the power supply – it’s HUGE at over eight inches in length. The cables are also very thick which exudes quality. Connections are also chunky which gives you some reassurance that you have a beast of a machine in your possession. The premium pack contains a 20Gb hard disk – the core comes without. To take advantage of the 360 you MUST use a hard disk. You can download demo’s, smaller arcade games, videos and music to the disk. You can also get downloadable content for games (new maps for instance) and it’s the only way to play you old Xbox games. It is essential and one of Microsoft’s poorer decisions was to have a Core pack that didn’t contain the hard disk. Switching on (in standard definition with RGB scart) and you can see instantly that it is graphically ahead of any current gen console. At first the console didn’t seem to noisy but that all changed once I put in a game and a second (maybe even third?) fan kicked in. I thought the Xbox would have floated harrier like there was that much noise. Once the sound from the game kicked in you didn’t notice it but it certainly noisy. Inserting the game highlighted what I think is the weakest part of the console. The DVD tray is flimsy and does not inspire much confidence – you definitely do not want to hit it with any force. The eject button is also of poor quality. However the remote control should help. Yes – at last there’s a game console that comes with an IR port as default and a lovely remote which you can buy (Premium packs come with a free but smaller remote with no back light). It makes a massive difference being able to control volumes, power and menu’s easily with the remote – well done Microsoft – only 20 years after every other electronics device included IR as standard. The remote also allows access to Media Centre content but that’s for another post. The controller is sheer bliss. It’s perfectly sized and all the buttons are comfortably reached. The black and white buttons have also moved to become shoulder buttons. At last. The wireless works to a range of around 30-40ft. You can also switch the console off and on via the pad. The only thing you have to remember is that conversations can keep going while your not at the console – use the mute button wisely. Speaking of conversations the headset isn’t as comfy as the last one but the plastic is a bit more bendable so hopefully they won’t break as easy. Connectivity – 3 USB 2.0 ports and a network port too. More than enough and when you see how flexible it is compared to any other console you realise it doesn’t really need any more. Annoyances – I’ve already mentioned the DVD tray. The wireless controller should have come with the charge and play kit. Would have been nice if it was a bit quieter. To really challenge Sony it has to capitalise on the hype now and get more stock in the shops as quick as possible. And that’s it. No crashes yet, no loss of wireless connectivity. Everything thrown at it just works. So – a great console in the making but it needs good infrastructure and great games to really challenge Sony. More on these topics in future posts – I’m off to play PGR3.